Collecting Children's Books: Chucky Who? My great-grandmother was born a Jefferson in the state of Virginia and, yes, one of her (and my) many-times-removed cousins is pictured on the nickel. Although I never met her, she sounds like quite a character. Once, when she was a young girl, she was told to stay home and tend the farm animals while her family went off to visit friends. Instead, she skipped out on her assigned task and, by traveling a series of backroads, sat waiting on the friends' porch drinking a glass of buttermilk when her family's buggy pulled into their yard an hour later. But the worst thing she ever did involved a doll. I should start by saying that this part of the Jefferson family didn't live someplace grand like Monticello. They were the poor relations, barely eking by on a subsistence farm. Work was hard, luxuries were few. So when my great-grandmother's mother decided to give my great-grandmother and her sister each a doll for Christmas, it wasn't a matter of running down to Toys R Us and picking up a pair of Malibu Barbies. Instead, it meant setting aside a scrap of fabric that could have -- probably should have -- been used for a quilt or for patching pants; it meant sitting in front of a kerosene lamp late at night, bone tired, to stitch these dolls together. So imagine it's Christmas 1864...1865...I'm not sure of the exact year. Imagine two little girls receiving a ragdoll each for their only present. Then picture my great-grandmother throwing her doll directly into the roaring fireplace. Why? Because she thought her sister's doll was prettier than hers! Can you imagine? Hearing that story a hundred years after-the-fact I was horrified. Those who knew my great-grandmother in later years said she obviously felt bad about her actions. In fact, the incident must have haunted her, because she continued talking about it right up to the time she died in the early 1940s. 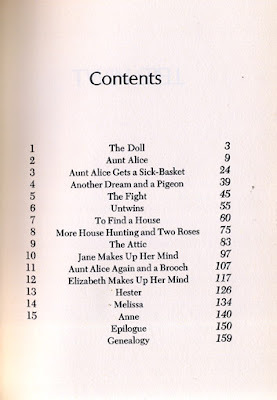 I have been thinking about dolls the last couple days -- ever since I came across a copy of the book DOUBLE SPELL by Janet Lunn on the library shelves. There was something familiar about the title, so I took it down and read the pull-quote on the back cover: "Ever since we've had this doll," Elizabeth said hesitantly, "we've had funny things happen -- the same dreams and stuff." The text below that described a story of twin sisters and an old doll that "brings the twins terrifyingly close to the world of the supernatural" and that's when I recalled that I'd read this book many years ago. Flipping through the pages, I remembered the rainy morning the sisters discover the doll in an antique store window...followed almost immediately by one of the girls falling down twenty-eight stairs and breaking her leg. I remember Amelia-the-doll mysteriously disappearing from where she was left...household objects being found in disarray...disturbing dreams and visions. And it all started with the arrival of Amelia. Yeah, this was one scary book! Yet I still had the persistent feeling that something was wrong. I did a little research and discovered the Puffin paperback I found at the library had a different title than the book I remembered. DOUBLE SPELL was, in fact, the original title of the book when it was initially published in Canada in 1968. But when Harper published the American version in 1969 it was titled TWIN SPELL -- and this was also the title on the Yearling paperback I read as a kid. Now it's apparently gone back to DOUBLE SPELL again. Okay, so that mystery was solved...but still...I continued to be haunted by the idea that something was missing from this book. As I continued trying to identify the source of my discomfiture, I did a little more research and discovered that DOUBLE SPELL...TWIN SPELL...whatever-it's-called...isn't the only children's book featuring an evil doll. 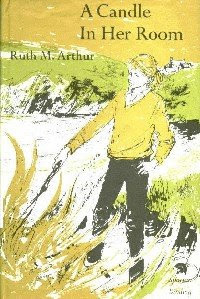 Many readers vividly remember Ruth M. Arthur's 1966 novel A CANDLE IN HER ROOM, which describes how three generations of a Welsh family are affected by an evil doll named Dido. Used copies of this book sell for a premium -- and is it any wonder after you read some of the amazing reader comments on Amazon.com? One person says, "Never, before or since have I read a book which affected me the way this one did. I remember it in almost uncanny detail. I have read thousands of books since I first got a copy of A CANDLE IN HER ROOM, and still I don't think I have come across one that came close to meeting the impact this one little Weekly Reader book had. Thirty years later...I don't know if I could even explain how it makes me feel." Another says she can still repeat the book's first and last lines. And how about this comment: "I remember throwing the book into a roaring fire in the fireplace the minute I finished it. I couldn't have the book around any longer, it was so haunting. I had many sleepless nights in which I would picture the doll burning in a fire, yet still able to use her evil powers. This book had more of an impact that any I have read before or since, and I have toyed with the idea of reading it again as an adult. I just don't know that I'm ready to bring the images back to life, based on the memories I have." (No, my great-grandmother didn't write that one...but what is it about dolls and roaring fires?) 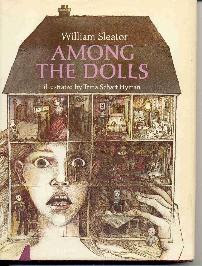 William Sleator published his own twisted doll story in 1975, a thin novel that places a young girl inside a dollhouse filled with nasty, taunting inhabitants who say things like, "Remember, you are small and helpless now" and, menacingly, "You're in our world now." As always, Sleator's prose provides maximum chills and could there have been a better artist to illustrate this type of book than Trina Schart Hyman? 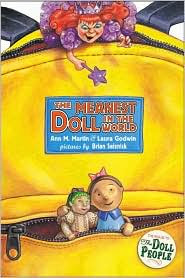 THE MEANEST DOLL IN THE WORLD, written by Ann M. Martin and Laura Godwin and published in 2003, shows that sometimes dolls even turn against their own. In this one, a princess doll, Mean Mimi, and her army terrorize nice-girl dolls Annabelle and Tiffany by doing things like launching toy race cars at them -- and worse. Not all literary dolls are this bad. I mean, you couldn't find a nicer doll than Raggedy Ann; she wears her heart on her...well, chest. Hitty isn't hateful. Betsy-Wetsy isn't invidious (just incontinent.) And Miss Hickory may be a little hardheaded, but she certainly never tried to run someone down with a toy car or send them tumbling down twenty-eight steps. Oh, and speaking of dolls who send people sprawling down the stairs...it took me two days, but I finally remembered what was missing from the Puffin copy of DOUBLE SPELL that I found in the library. I know, you're wondering why that matters -- especially since each chapter title of DOUBLE SPELL is correctly labeled throughout the book. Do you think Puffin didn't notice this? Or just didn't care? Either way, I imagine Amelia-the-doll wasn't very happy that they removed her picture from the book. And an unhappy doll can be a dangerous thing. Maybe Great-Grandma had the right idea. Thanks for a great post! Dido terrified me for years - "A Candle in Her Room" is one of the scariest books EVUH. Your great grandmother's doll story reminded me of another Ol' Virginia girl's doll story. It's very similar, but the girl doesn't burn her own doll she hangs her sister's! never tied a knot before, but this held, as did the loop I cast over a projecting branch of the sickly peach-sapling. " --From When Grandmamma was New, a terribly titled, but wonderful book. be sure to read the one by Lisa Rogers and then the one entitled "I'm Jessamy"
There's an Agatha Christie short story that I read as a young teen that was probably one of the creepiest things I've ever read. It was one of Christie's rare forays into the supernatural, and it's a pity she didn't continue along those lines since she was darn good at it. The story involved two old women who ran an antique store and the evil little doll that haunts them. I've always been disturbed by objects that move without anyone touching them, and this story just solidified that fear in my mind. Yes, what IS it with dolls and burning? I think there's a burning doll motif in Sally Gardner's I, Coriander -- only when this doll is burned, she comes to life and dances among the flames, taunting her tormentors! "Behind the Attic Wall" by Sylvia Cassedy is also an amazing book to read! Also, "the DollHouse Murders" by Betty Ren Wright...........both of these kept me up at night.....in a good way! I think that it is really good, I would like to have the chance of read one of these books as soon as possible!